We were waiting for this significant day for about a month. 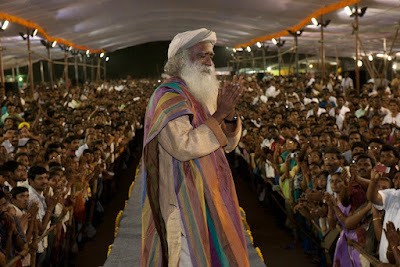 It was Sadhguru's sathsang for Chennai Isha meditators. 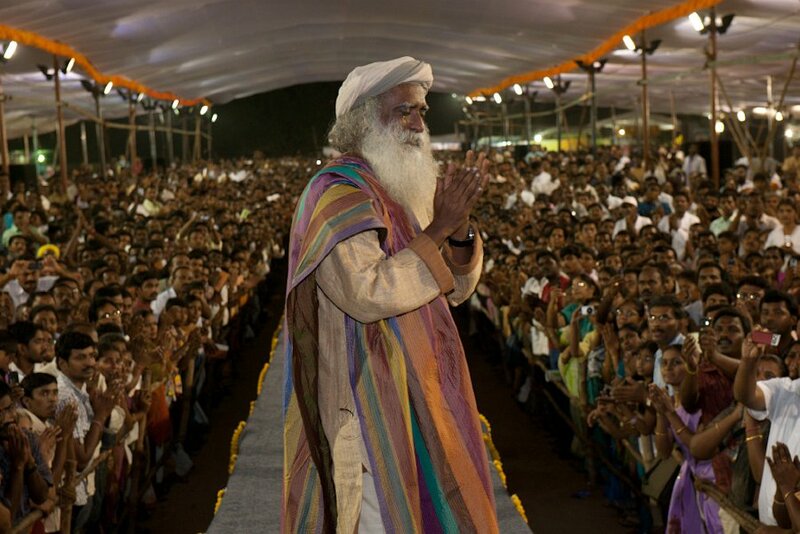 When I was in US, I had seen Sadhguru more frequently than what I see him here. In about 2 years of time since we reached India, I have seen him just a couple of times, during Isha Fest and MahaShivarathiri. June 22nd - it was a Sunday morning. I woke up, got ready with little bit of difficulty as periods pain troubled me a lot that morning. But there was just excitement all over me. We reached Valluvar Kottam, found a parking space between two cars, parked our vehicle along side another two-wheeler. I would have rushed into the building, if it was a usual gathering. But it was Isha and Sadhguru, some gentleness embraced me. We went close to the hall looking for a place to leave our footwears and helmet. Then I saw rows and rows of neatly arranged footwears. Did someone come and arrange it?! It was left by meditators with such care and neatness. We did the same and entered into the hall. I could feel every step taken by me, so gentle so that I don't hurt the carpet spread across the vast hall. We sat at about 100 feet from the Sadhguru's dais. Sounds of Isha was being played by those eminent Isha ashram mates (mostly Brahmacharis) with rhythmic beats from the audience clapping their hands. The hall was roaring. Suddenly the people seated in the front started getting up, more and more stood up, like a wave. It was not difficult to figure out, it was my Master's arrival. I stood up along with others to get a glimpse of his face! My eyes started watering overwhelming with joy, bliss and happiness; my hands went up together, welcoming him. My life was made, I felt. He went up to the dais, looked at all of us gently spreading his wave of bliss over us. After Sadhguru took his seat, we seated ourselves on the floor. The Sathsang started with 'Brahmananda Swaroopa' chanting from Him. His electrifying presence and voice sent an indescribable feeling through my spine. My mind couldn't comprehend nor react to this. My eyes were watering more and more. It was like every nerve, every cell felt His presence. This is about a resignation episode that went on in my previous company - one of the IT majors in India and around the globe. Typical case how companies lose talented people. He thought he was gifted to be with a manager like her. But somehow somewhere, his Bangalore management was not happy with him. His performance review went for a toss! He moved onto another project. Now in the new project, he managed about 25 people, and the team was constantly growing in size and had not more than 2 team leads. The team was inexperienced and looking forward to Dileep for advice on their every move and handle any technology related issues. All his cry for senior resources was heard with sympathy - but nothing was actually done. He sent email over email to senior management. Onsite team turned out to be utter nonsense with no capability to handle the clients in whatever sensible manner. All they could do was do a blaming exercise so that they were safe. Geetha replaced APM Murthy with Martha to help Dileep since Murthy did not have enough bandwidth for Dileep's project. Unfortunately she hardly realized that it was like adding fuel to the fire. Martha was a newly promoted APM amongst lot of hassles (well... thats the opinion owned by many in that office). She was rude, unprofessional in handling her team members and had never liked Dileep or his wife who was in her team before. She wanted to prove a point to Geetha that her promotion was justified. There are a couple of ways to prove this. 1) You do your roles and responsibilities in an outstanding manner. Though it is unethical, she took route 2. Dileep was blissfully unaware and offered all support to make her transition smooth into the team. Team was terrified on hearing the news. Dileep assured that her interaction would be restricted to him alone and not be allowed to step into the team members' arena, which didn't happen anyway. When each of her attempts to dethrone Dileep from his position was shot down by him, she made bigger attempts. Finally she succeeded! Three months later, his name appeared in a casual chat with Geetha. Geetha and I had an excellent rapport. To me she was (she still is) a compassionate person. She was supportive in every possible way without compromising any of the project demands. When she casually asked about Dileep, someone said "he is having a toast as a technical manager". "Yeah... he does technical management better than project management", she replied instantly. I was taken aback for a moment. Hmm... what made her make that comment?! She knew he was one of the best project managers and team managers across the company. Well... she would not have any problems with convincing Chennai management because anyway, they weren't happy with him. Then where could be the problem? Where was the justification needed? It was with the Coimbatore office. Most APMs, PLs and Managers knew Dileep as a star professional! It was conveyed, "He is good technically, but not so with project management"
Phew!! She too needed to save her back! And there ends the drama. But she did the best to two people - Martha and Dileep. She rendered all her positive support to Martha despite her venomous behavior, thinking that she could straighten dog's tail. The very same action made Dileep focus to the opportunities outside! He moved to another company. Having handled Martha and seemingly insane onsite, he was ready, fully equipped to handle any kind of person, situation and technology is his passion. Now the question is 'did anyone do wrong here?'. Answer is 'no'. Every person trying to excel in whatever they do just do what they think is best. When you are pushed to a point where fight and flight are the options left, it is important you choose among the two. Either you fight or quit! Geetha, Martha and Dileep are all in good positions today carrying the learnings, experience from their past. So, if things are not going fine, it is time you think about a change. If there is any good time to do it, it is NOW! It started like this... One fine day, all of a sudden I didn't quite feel alright. Shekhar sensed it! I didn't believe initially. Thanks to Google - I was convinced even without any tests being taken, that it could be so. Next day, we rushed to hospital! Guess what! It turned out to be a Sunday and there were no doctors in the nearby hospital. Could I wait till Monday? No way! So with loads of excitement, we went to Ramakrishna Hospital, about 5 km from my home; reached the place 20 minutes short of 12. The receptionist asked us 'which doctor do you want to see?' We had no clue :) Libi was trying to reach me from Bangalore to know what was happening. I took her call and asked her if she knew someone in that hospital. Libi's mom was answering from behind, "Ask her to go to Dr.Mridhubashini'. I blurted out to the receptionist 'Dr. Mridhubashini'. "She is not available now. Would you like to meet one of her assistants?' ~Oh! What will we do now!~ We said 'OK!' without giving much thought. 'Please proceed to Women centre... Go fast, as the consultation closes by 12 today' she said nonchalantly. I hung up the call with Libi while I moved towards the building. The women's center was located in the 1st floor of the building. The person there asked us the registration number. ~Now what is that?!! Having done with the seemingly lengthy registration formalities, the registrar informed the sister there, 'one more to go. with this patient, we will close for today. ~Thank God! There was little time to anticipate anything from the visit. As we were waiting in the waiting hall impatiently, 'Abirami, please come for the check up!' the microphone in the hall shouted. That was quick!! Oh! We are really going to meet the doctor now!